At the start of the college football season, the Military Bowl had commitments from the Atlantic Coast Conference and the Naval Academy, and a deal with Conference USA should the Midshipmen fall short of bowl eligibility. At the end of the season, the bowl has exactly zero teams from the ACC or C-USA, and Navy won’t be playing anywhere after this weekend. Yet, somehow, everybody’s happy. 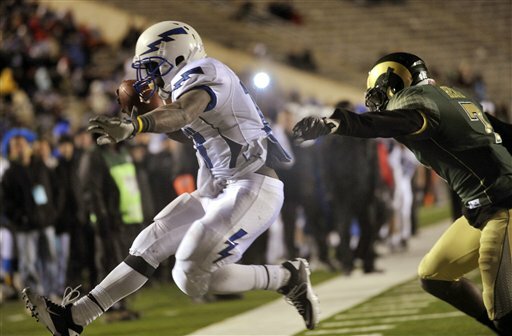 Frank Schwab of the Colorado Springs Gazette has the details behind the seemingly simple steps that put Air Force in the Dec. 28 bowl game at RFK Stadium in Washington, where the Falcons will face the Toledo Rockets. The lynchpin appears to have been the Independence Bowl, which had the right to select the Falcons thanks to a tie-in with the Mountain West Conference. Bowl organizers knew the Falcons wanted the Military Bowl berth instead, and with Missouri available to fill Air Force’s spot, they passed on Air Force. And with the ACC unexpectedly sending two teams to the Bowl Championship Series (Virginia Tech lost by 28 points against Clemson in the league title game; in exchange, it’s going to the Sugar Bowl. Makes sense. ), a spot came open for the Rockets, who finished the year at 8-4. Enough with the back-room deals and bizarre bowl constructions — want to watch some post-holiday football? Go here to see when active-duty troops can pick up free Military Bowl tickets from USO centers throughout the D.C. region. The bowl, presented by Northrop Grumman, also has a donation page where a $25 offering gives one service member a premium ticket. We now return you to Army-Navy week. Pingback: Military Sports Report - After Action – Bowl update: Who might Mids, Falcons face in postseason?